Place file 1 and the newly joined file 2 on a webserver ready for import into OVM. 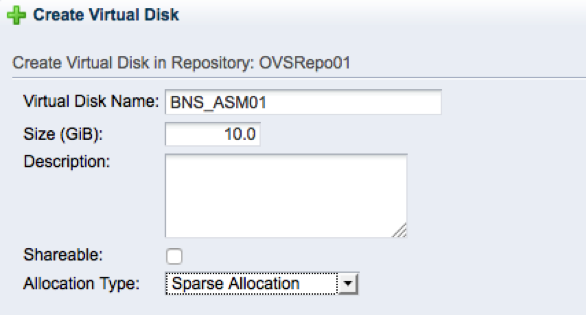 Follow the readme to create a VM, I decided to use 2 ASM disks in 1 diskgroup instead of the minimum of 5. I’m also deploying the oracle restart and not the RAC at this time. Edit the VM and remove a network card, the second card is normally for interconnect in a rac deployment. Place it on any linux machine, I normally place it on the OVM manager because of why not. ERROR: This deploycluster.py version (v2.1.0) does not support connecting to Oracle VM Manager higher than 3.2; found Oracle Manager version 3.3. See My Oracle Support Note #1185244.1 and OTN for deployment options on this version. But no guidelines on manual deployment. export CMD="/u01/app/oracle/ovm-manager-3/ovm_utils/ovm_vmmessage -h 10.100.23.6 -u admin -p password -v BNS"
$CMD -k "com.oracle.racovm.netconfig.arguments" -V "-n1"
$CMD -k "com.oracle.racovm.netconfig.contents.0" -V "
CLONE_SINGLEINSTANCE_HA=yes  # Setup Single Instance/HA (Oracle Restart)"
$CMD -k "com.oracle.racovm.params.contents.0"  -V ""
$CMD -k "com.oracle.racovm.racowner-password" -V "oracle"
$CMD -k "com.oracle.racovm.gridowner-password" -V "oracle"
$CMD -k "com.oracle.linux.root-password" -V "ovsroot"
$CMD -k "com.oracle.racovm.netconfig.interview-on-console" -V "NO"
That’s it, We deployed a VM with Oracle Restart and a 12c database with ease. 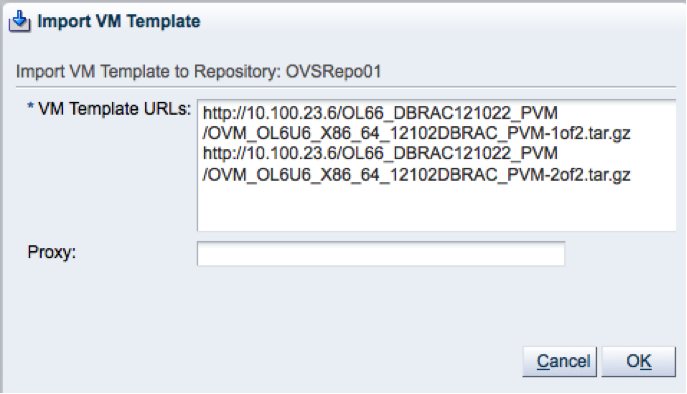 Just a quick blog entry to let people know OVM 3.2.1 is now officially released. You can find more info in Wim Coekaerts blog entry. A lot of my clients ask me about Disaster Recovery in a OVM setup. I hope this new event of oracle gives us some more insight. You can register here. I’ll certainly check it out. The whitepaper the event is based on can be found here. Consistency between the Primary and DR site is not handled in this paper.According to Oracle this is a task for the application (f.e. Dataguard ) or the Storage layer (f.e. EMC Recoverpoint ). The white paper handles all the necessary tasks to make sure vm’s can be seen and started on the DR site. I hoped there was more possible with the tight integration of UEK and OVM. But offcourse, is that really needed when you can already have consistency solutions on storage/application level? I believe VMWare has some solutions for this. Anyone care to elaborate on those? I’m giving a presentation on this topic on thursday 25 Oct for OracleOpenXperience. Here are the slides for my presentation. Hope you find it interesting.